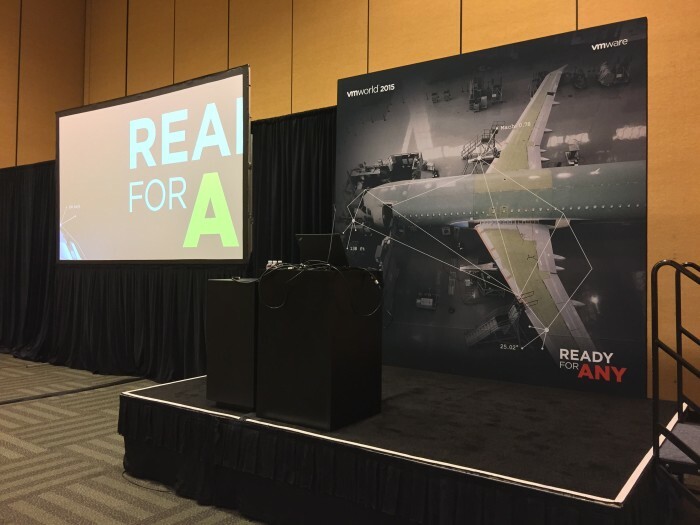 This post will be filled in over the next few days, highlighting my personal experiences at VMworld 2015. A lot happening here, especially given I'm here as both a blogger and a presenter. Also a lot of fun, seeing so many familiar faces from the northeast like Matt Brender and Mark Gabryjelski, and meeting people for the first time, like John Mark Troyer, who I've only known online from many a Geek Whisperer episode. Come on back and hit refresh! 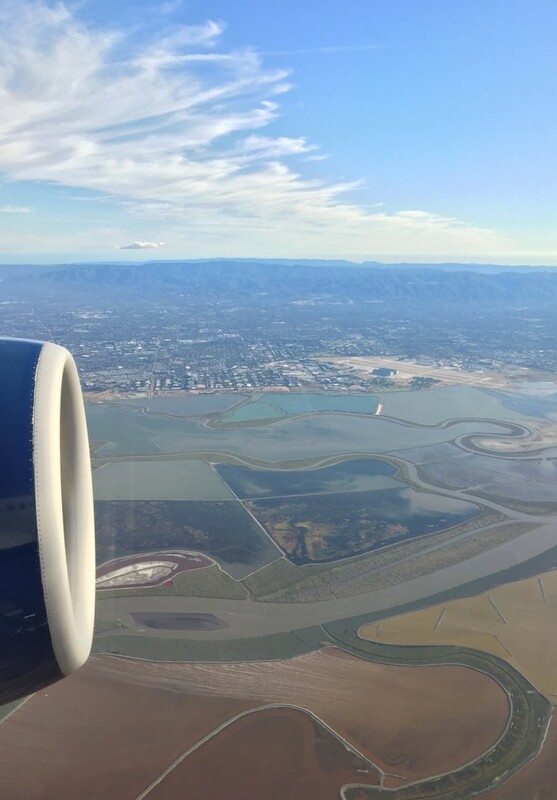 Flew on over to SFO. Google's Moffett Field pretty easy to spot. Started with a super fast and easy registration, then a walk over to Moscone West speaker services to finishing up the PowerPoint. Then headed on over to see the room I'll be presenting in. Part of this busy day included visiting the Intel booth, asking around about their latest offerings, and 10GbE, hoping to have more details to share soon. Ended this lovely first day with great conversations at VMUnderground at aptly named City View, always an inspiring spot. Started with noticing the huge line at Mel's Diner, so off to Denny's for me. 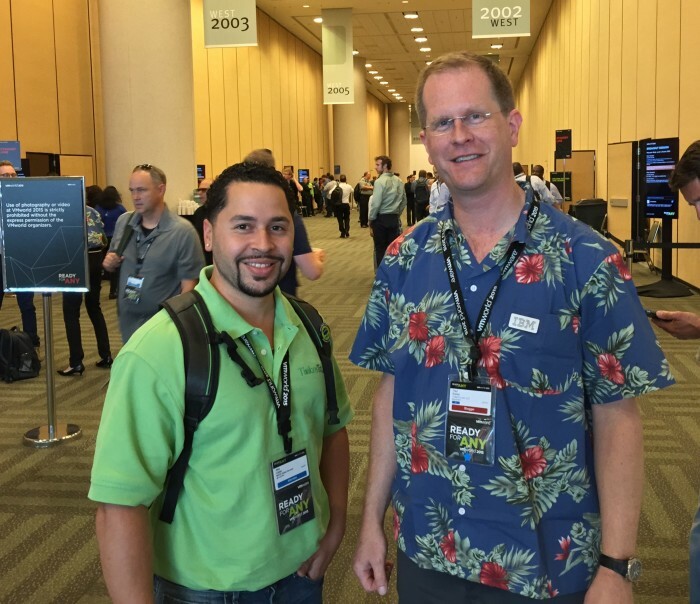 I also managed to briefly attend SolidFire and Zerto parties, highlighted @paulbraren. Started the day of with breakfast with SIOS and SanDisk and a bunch of vExperts including David Davis @davidmdavis, Matthew Leon, Luke Gray @VirtualLukeG, and Matt Jones @Favoritevmguy. Great conversation, and sure beat the Denny's I had yesterday! Finished the presentation, about 60 folks in the room. Despite a 90 second lull due to a VPN blip, it went pretty well, and the talking to people that came up to me afterward was the best part. One of those people was Alex López @iVirtuAlex, proud owner of the first TinkerTry.com polo shirt. Alex, I can't thank you enough for your both attending our session, and the feedback about TinkerTry. It is greatly appreciated, and means the world to me. My first TinkerTry.com shirt spotted in the wild! Alex Lopez and I, right after my presentation. 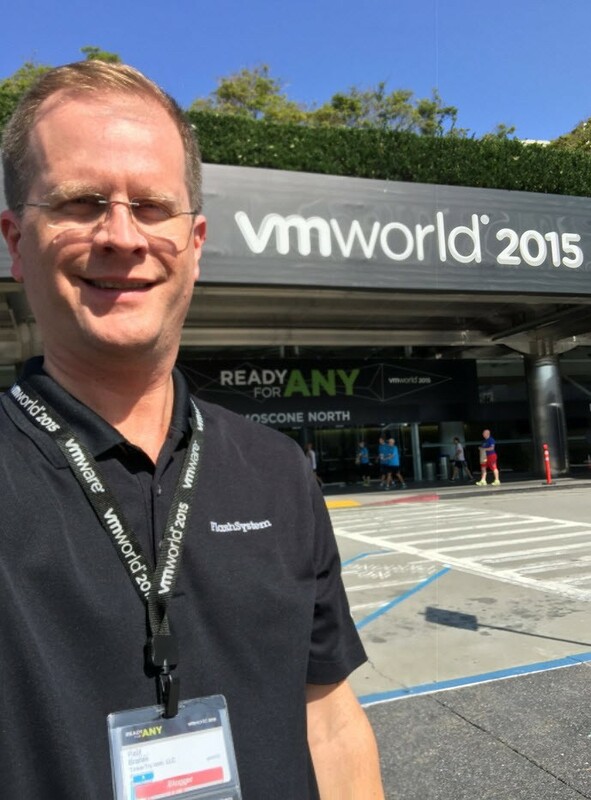 Look who I ran into at the VMware Solutions area today (tweeted the next day)? It's Father Robert Ballacer, from This Week in Enterprise, along with Bryan Burnett from Know How. Next headed to the vExpert Gathering, followed by the Veeam Party at City View. It was great fun to see many familiar faces at both events. 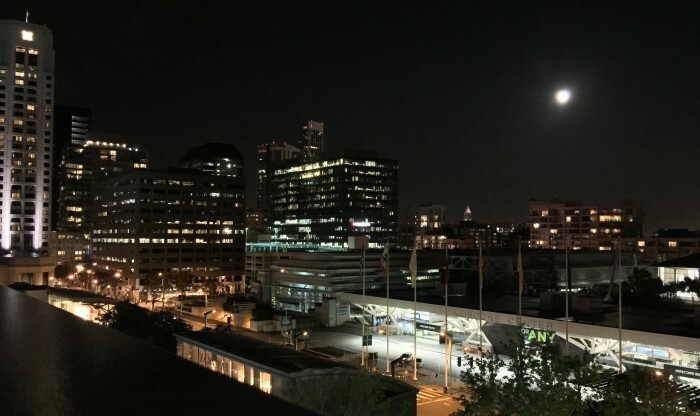 Headed to SimpliVity breakfast, followed by a Zerto briefing, then a discussion with various vendors. Also stopped by to talk to some folks at Micro, OCZ, CDW, QNAP, Synology, and Solarwinds. I managed to grab some brief interviews with folks I met in the blogger area, enjoy! The day started out with a scientific keynote presentation, by neuroscientists. Right up my alley, with a dash of refreshing humor. Also managed to finish getting 3 more videos uploaded, with an overview of NAS vendors QNAP and Synology and backup Veeam Endpoint Backup FREE. No fancy editing here, but they get the points across, and were quite fun to do actually. Went to two more sessions, and had a bit of fun. 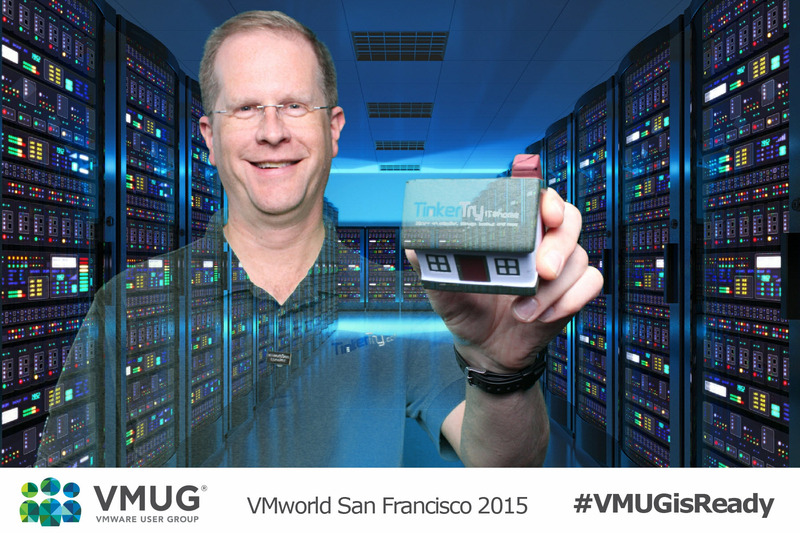 VMUG Lounge at VMworld had a fun photo booth. 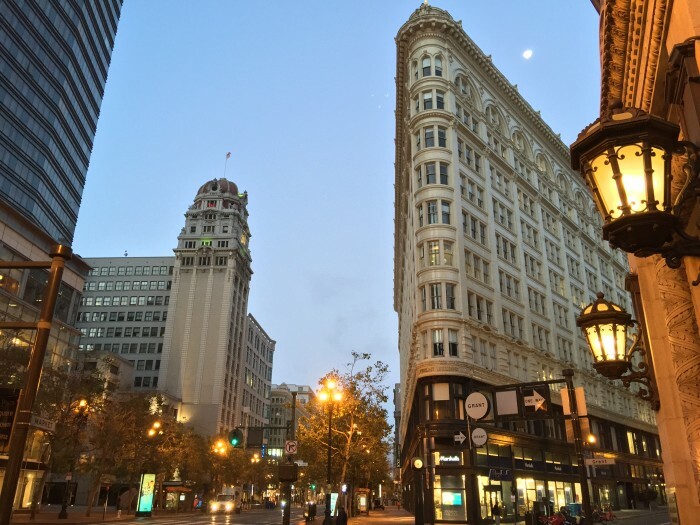 Finished up the day with a bit more time with Franklin Hua, and dinner near the San Francisco Ferry Building. Hadn't been to that area before, what a wonderful spot, and a great place to walk around my last evening in town. I had some meetings, and ended the day with my first visit to the Computer History Museum in Mountain View, CA. Seemed rather fitting that on my way there, I found myself behind a Google self-driving car. I even saw another one parked but running, with a tourists and a selfie stick. Yes, I was in geek-central, and of course, I ran into a VMware employee while in the museum. Very fun to look way back in time, including back to my first computer, the Commodore VIC-20. What's New in vSphere 6.0 Update 1 for VCSA?